This durable bag works great, not only for dirty ballmounts, but for all your towing equipment, such as tie down straps, pins, clips and locks. The strong handle makes it easy to carry and the large zipper opening makes it easy to operate. Call 800-298-8924 to order etrailer accessories and parts part number ETBMB or order online at etrailer.com. Free expert support on all etrailer products. 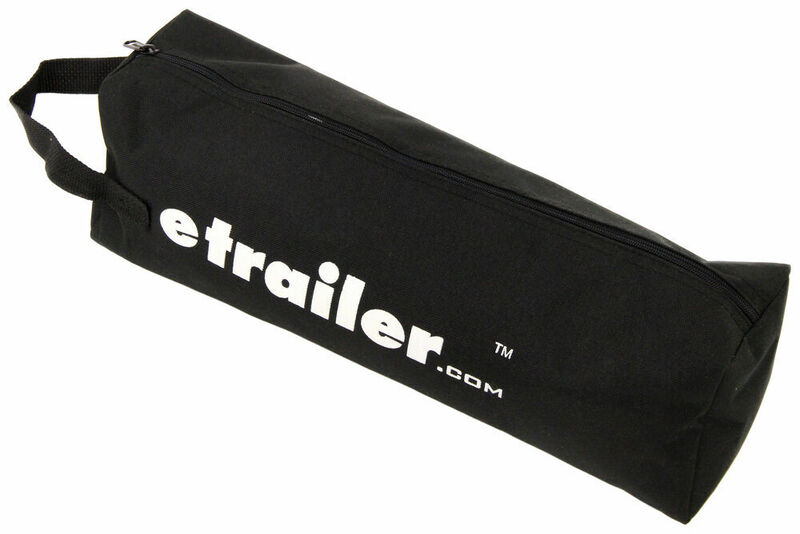 Guaranteed Lowest Price and Fastest Shipping for etrailer.com Ball Mount Bag. Accessories and Parts reviews from real customers. Also works great for all trailering equipment, tie-down straps, etc. 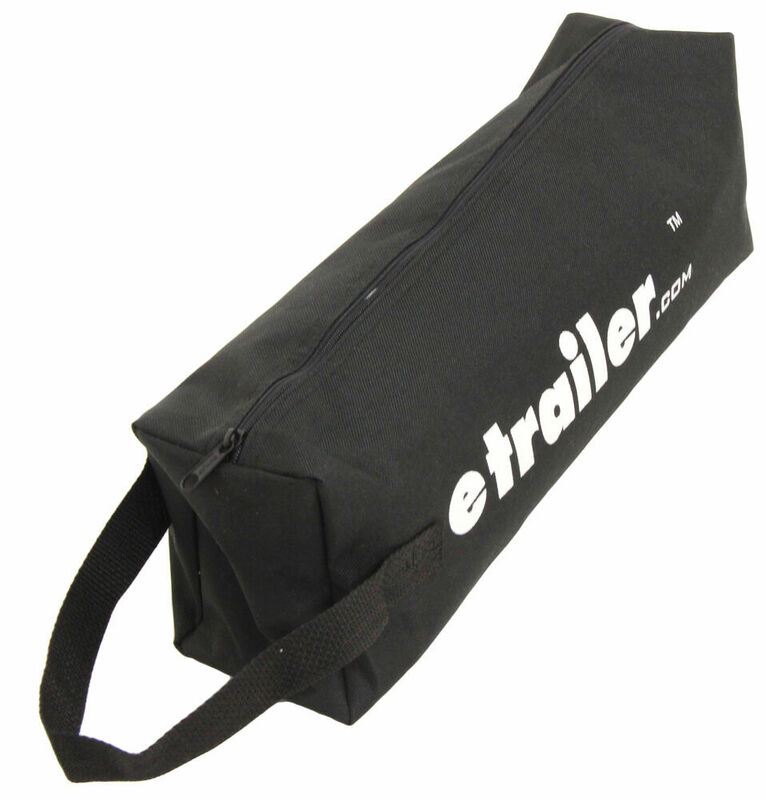 Today we're going to take a look at the etrailer Ball Mount Bag. This is a durable bag, which will work great not only for your dirty ball mounts but for all your towing equipment such as tie-down straps, pins, clips, locks. It's a very nice durable nylon construction. It will provide many years of use. If you notice here, it has a nice large zipper opening, which runs the full length of the bag, makes it very easy to insert your items into the bag. Also has a no hassle zipper closure, very easy to close. If you notice on this end, it has a nice strong reinforced handle. It makes it very easy for transporting of your heavy items. A few dimensions on this bag. The overall length from one end to the other is right at 17 inches. The height from the bottom to the top is 5 1/2 inches. The total width on it is right at 4 inches. What I'm going to show you now, we're going to open it up. The other nice thing I wanted to mention. I had mentioned this strong reinforced handle. If you look on the inside, you can see they do reinforce the stitching on that to make it easy to hold the heavy items in the bag. What we're going to have here is here's your ball mount with the ball attached to it. Just drop it right into place. Take your pin and clip so you don't lose that, put that altogether, and just zip that closed. You can see, it's very easy to carry along just like that. Then whenever you need it, just lay it down, and zip it open to access your parts. That should do it for the review on the etrailer Ball Mount Bag..
Order: RelevanceNewestRating - High to LowRating - Low to High This durable bag works great, not only for dirty ballmounts, but for all your towing equipment, such as tie down straps, pins, clips and locks. The strong handle makes it easy to carry and the large zipper opening makes it easy to operate. The bag is still holding together. Still very nice to have to keep everything together and easy to find. Thank you George! I made responses on those two reviews and am still very happy with the two items I bought. The bag is still holding up and the ballmount is exactly what I needed for my trailer. Didnt even need anti rattle clips. Thanks again, and please pass my thanks along to everyone else at the company. Great bag. I can keep my hitch in the truck without the interior getting dirty or greasy. The Ball Mount Bag lives in the back of the vehicle, keeping the hitch, ball, and pin in order, and the bag still looks like new - DURABLE ! To determine if a given ball mount will fit into bag # ETBMB you will need to go by the dimensions of the bag. The bag is 16-1/4 inches long, 5-1/4 inches deep, and 4 inches wide. Depending on how large your ball mount is it may or may not fit. 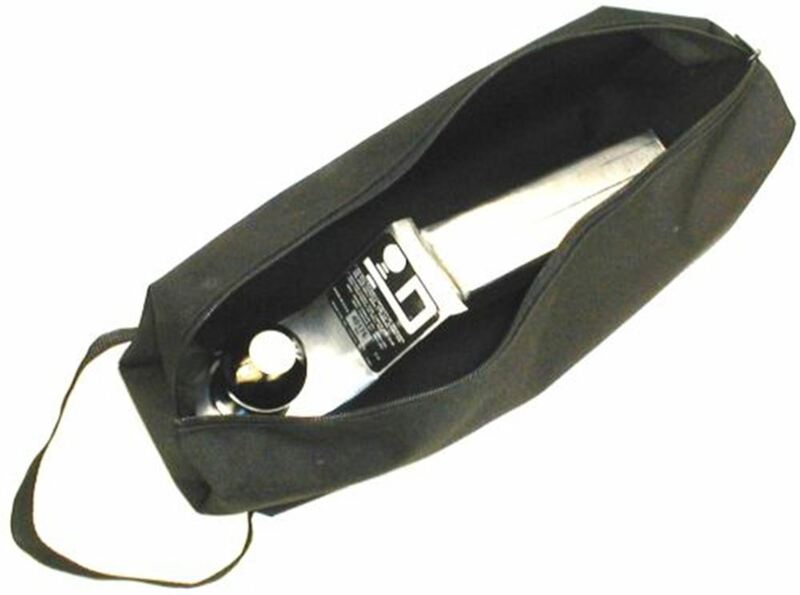 We also have CE Smith Ball Mount Storage Bag # CE27481 which is 15 inches long, 6 inches tall, and 4 inches wide. The etrailer.com Ball Mount Kit, # 989900, that you have referenced is the kit we recommend for a 2007 Honda Ridgeline. It comes with ball mount # 2923 and ball mount # 2753. It also includes a 1-7/8 inch diameter ball, # 19260, and a 2 inch diameter ball, # 19247. You will also get a hitch pin and clip # PC3, as well as a handy bag to store the parts in, # ETBMB. All of these parts are also available separately. I have included a link to our Ball Mount FAQ article for you to view. The etrailer.com Ball Mount Bag # ETBMB is 16-1/4" long x 5-1/4" high x 4" wide and may fit your Hidden Hitch 80240 our part # 40346 ball mount at an angle. Another option is the Rightline Gear Custom Roll Bar Storage Bag - Jeep - Water-Resistant - Gray # RL100J70 or Black # RL100J70-B which is large enough to handle your ball mount and is durable. We do not have a ball mount kit with a 2-1/2 inch ball mount and 2 inch ball but you can get those items separately. The ball mount that is used in the kit you referenced is # RP45323. For a 2 inch ball with a 1-1/4 inch diameter shank you can use # A-90 rated up to 10,000 pounds. And the storage bag is # ETBMB. Getting these parts separately will actually save you a couple of bucks! What you can do is get the parts individually since we can't swap the balls out in a kit. The ball mount is # RP45322 and the bag is # ETBMB. For a 2 inch ball that will fit use # A-90. But keep in mind that the ball is rated for 10,000 pounds which is less than the ball mount which is rated for 18,000 pounds gross trailer weight and 2,000 pounds tongue weight.